OPENCV Projects referred as open source computer vision which is a library of programming functions for real time computer vision. We provide OpenCV project code for computational efficiency and with strong focus on real time applications. 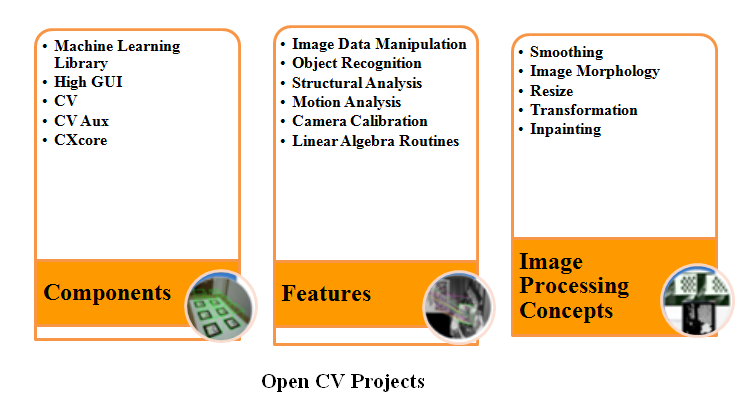 We provide OpenCV Projects Code for computational efficiency and with strong focus on real time applications and IEEE based projects. We provide OpenCV project code which is a license free for both academic and commercial use. We commonly use OpenCV project code in computer vision or Image Processing. OpenCV composed of library with 500 functions and we developed more than 110 projects in medical imaging, security camera calibration, stereo vision and robotics and factory product inspection. It is a set of functions and C++ classes to implement image processing and computer vision algorithms. Machine learning library, contain statistical classifies and clustering tools. Contain basic data structures and content. To store and load video and images, we use HighGUI with I/O Routines and functions. This component contains basic image processing and higher level computer vision algorithms. It composed of both defunct areas and experimental algorithms. We use OpenCV function that permit user to interact with OS, file system and hardware such as cameras are gathered into library called HighGUI. HighGUI permit user to open windows, display images, handle simple mouse, pointer, keyboard events and road and write graphics related files. We adopt high level operators on images structures for student projects to accomplish tasks defined in graphic context visual images. We also called it as blurring to reduce camera artifacts and noise. By function CVsmooth () it support five operation in OpenCV. OpenCV provide fast, convenient interface for doing morphological image transformation. This function fit source image to destination image size. Image can resided as upsize (or) downsize image using CVResize ().